Find out how these stocks have jumped in the past 10 years. You haven't had to be a genius to make money in this bull market. Over the past 10 years, if all you did was invest in an S&P 500 index fund, you could have turned $1,000 into more than $2,750 -- even though that $1,000 quickly lost value to fall below $600 by early 2009 shortly after the period started before bouncing back. Those who invest in individual stocks like it when things are a little more interesting. When you look at that same decade, a few stand-out stocks have delivered life-changing returns. In particular, Lending Tree (NASDAQ:TREE), BofI Holding (NYSE:AX), and National Beverage (NASDAQ:FIZZ) have all helped investors turn initial $1,000 investments into holdings worth $21,000 or more since 2008. How did they do it? Read on to find out. TREE Total Return Price data by YCharts. Lending Tree found success by doing something its customers love: helping them borrow money. Founded in the mid-1990s during the first tech boom, the company launched its internet website 20 years ago and came out with its well-known "when banks compete, you win" slogan shortly thereafter. Investors got their first bite at Lending Tree shares in 2000, but the ill-timed IPO eventually led to the company going back to privately held status after being acquired by IAC Interactive (NASDAQ:IAC) in 2003. In 2008, IAC spun off Lending Tree, which thereafter started a huge expansion to go beyond its best-known home mortgage service to incorporate broader portfolios of lending, including auto and educational loans. From a short-term perspective, now might be a good time to consider Lending Tree. Investors have shunned the stock this year, fearing that its ability to keep growing at breakneck speed could finally be coming to a close. Yet with no sign in sight of any slowing in borrowing activity, Lending Tree's gains of almost 3,300% in the past decade could continue to build once the recent setback reverses itself. BofI Holding is the company behind the Bank of the Internet, a pioneer in the financial world. Online banks came to prominence by offering amazingly high interest rates on deposits and impressively low borrowing rates for loans, and BofI in particular has stood out among its internet-based peers. Over the past decade, BofI's asset base has climbed more than eightfold, and earnings are dozens of times higher now than they were during the worst of the financial crisis. Like Lending Tree, BofI has seen some tough times lately, in part because rising interest rates are forcing it to pay more money to depositors, boosting interest expense. Yet the lasting competitive advantage that BofI has over brick-and-mortar banks is that it doesn't have to pay for maintenance and upkeep of extensive branch networks. Moreover, with smart collaborations and strategic acquisitions that have helped it get into lucrative areas like tax refund anticipation loans and business equipment leasing, BofI is looking at multiple ways to stay on top of the growth game. Finally, National Beverage is just about as far as you can get from the internet, selling an array of soft drinks, energy drinks, and other beverages. Its biggest success in recent years has been its LaCroix line of sparkling water, which found itself on the ground floor of the shift in consumer demand toward healthier food and beverage products. Instead of wanting high-profile sugary soft drinks, customers now appreciate the simplicity of sparkling water, and impassioned CEO Nick Caporella has a leadership style that inspires devotion among employees and shareholders alike. Adding to National Beverage's gains over the years have been periodic special dividends, which have resulted in nice pops of income from time to time. All told, the company has paid out more than $10 per share in dividends since 2007, and those who've reinvested that money have enjoyed the biggest gains. The health craze in food and drinks looks poised to continue, especially with merger and acquisition activity picking up in the space, and that puts National Beverage in a good place at just the right time. 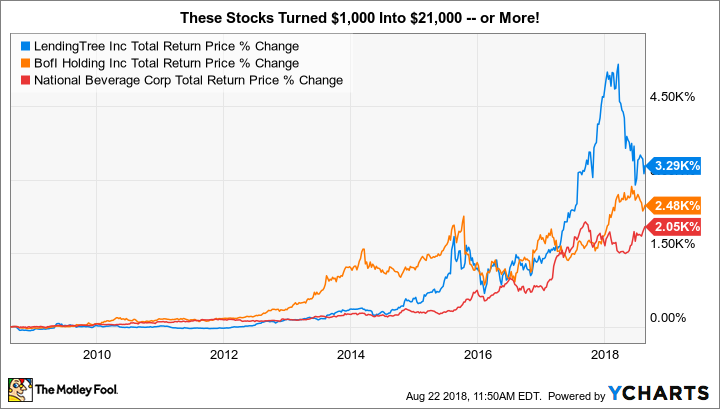 Not every stock will do nearly as well as these have, but the key thing to learn from these stocks is that given a decade or more, many companies can produce impressive wealth. Moreover, for these three companies, solid prospects make further gains entirely possible for the foreseeable future.